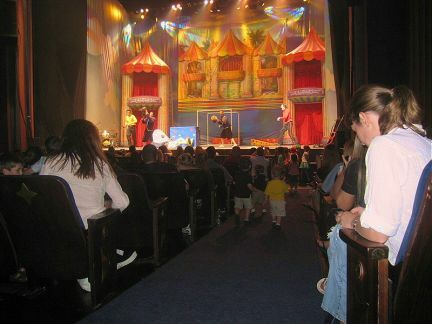 What does it mean - When your son almost gets kicked out of a Wiggles concert? 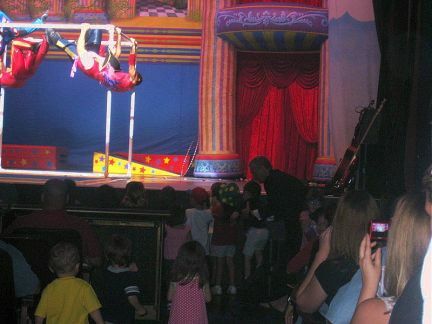 When your son almost gets kicked out of a Wiggles concert? Your son only being 3? It all starts off innocently. Lil J being the sweetie he normally is bringing his brother down stage to dance (lil j in blue, younger brother in yellow). Now my oldest is way too shy, so by dance I mean just watch his baby brother dance while he just smiles. Then somehow the music loosened him up b/c next thing you know, I see my SON waving hello at the Wiggles on stage. A bouncer has to carefully remove him FROM THE STAGE!!!!!!!! 1. dad took him down to the front to dance. key word being DAD. mom was sitting in her seat too far up to see what was going on. 2. dad must have been caught up starring at joshee dance since lil j is normally doing nothing. he is not built with a third eye. 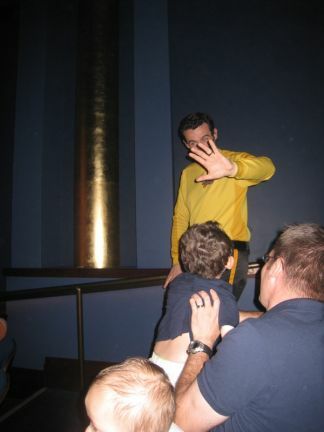 4. or lastly, I could be in a lot of trouble if he can get in trouble at 3 at a wiggles concert. What's funny is, we've gone to a lot of kid concerts. This was the first one where all the moms were in the bathroom putting on makeup and wearing dresses you normally don't wear. I looked online and apparently they have a lot of issues with live chats w/the wiggles, etc ...because moms can't stop throwing themselves on them. Really?? I'm embarrassed FOR them. Thankfully they didn't seem mad since Sam (head wiggle) made it a point to stop and say hello to the little dare devil. I told you mom is a terrible picture taker. NEEDLESS TO SAY... dad was very proud his son got in trouble at his first concert. Me, not so much. If you take them to Disney World, be careful if they get selected to take part in the Star Wars light-saber battle with Darth Vader. Might be fun to watch though. Good to know. Disney World is what we already signed up for (timeshare) at the end of 2010. We went last year with our Grandchildren (and son & D in L) and as I remember they felt one of the best parts of our trip was the "Pirates and Princesses" night. It is a little pricey but it allows you to go on every popular ride without all the crowds. Do a Google searc and find out if there are any scheduled for when you go. You can do something else during the day (Sea World or Busch Gardens) and see so much at night. Disney closes the park to anyone who does not have a Pirates and Princesses ticket and their is virtually no waiting for any of the rides. I recall it was from 7 until midnight and then Fire Works at the Magic Kingdom Castle. They all loved it! Our son and his family were able to ride the most popular rides multiple times. Ha, ha, ha that is sooo cute. A little rebel rouser. Obviously those Wiggles have magnetic personalities. I read the other day that the Wiggles are the highest paid entertainers (45 million) in Australia which isn't too fair since I think their salary is a total for all 4 of them. Either way, the list had them beating nicole kidman, russell crowe, etc. Yeah I remember reading something like that too. It was in an article about the member who left the group not long before they got famous. Duh, good timing NOT. Haha! I think you have a little punk rocker on your hands! It means ... that more stuff goes wrong when Dad is in charge.